Eating high fiber foods is key to weight loss! It is one of the most significant food choices you can make to be permanently slender. Here's why. Fiber adds bulk to your diet and is essential for good digestion and for elimination. Because it is slow to digest it helps to stabilize your blood sugar which is good for losing fat and if you are just following a diabetic diet. You need both soluble (dissolves in water) and insoluble fiber. Insoluble fiber acts like a "sweep" moving food through your colon. It helps you maintain a healthy bowel. The soluble fiber, found in fruits, vegetables, oats and barley help you to feel full. Any whole grain means higher fiber. All fruits and vegetables have fiber. 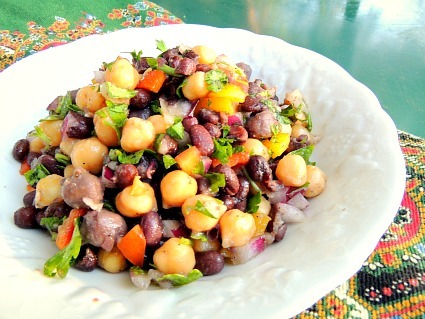 There are many interesting, flavorful ways to serve these high fiber foods like the three bean salad above. When you add a green leafy salad with feta cheese you have a complete meal. Beans are not only high in fiber they are high in protein and contain folate, iron, zinc and vitamin B1. They have both soluble and insoluble fiber. Beans add nutrition to your diet and they are filling so a small helping goes a long way. Eat them slowly and chew well. A legume is a plant with a pod like a green bean or pea. All beans are legumes. Legumes have more fiber than any other food. They are a good source of choline which is important for cardiovascular health. Lecithin is a fatty acid, a type of lipid, and it's derived from soybeans. It is composed mostly of the B vitamin choline and contains linoleic acid and inositol. I mention it here because it helps in the digestion of fats and the absorption of fat-soluble vitamins. It enables fats, such as cholesterol to be removed from the body. You can buy lecithin in granular form as a whole food supplement in the refrigerator of your natural foods market. Since it helps clean your arteries and it supports your nerves and brain function, it's a healthy way to boost the nutrition of your cereal in the morning! Try a tablespoon of lecithin along with your flaxseed meal. Lentils are high fiber foods and my personal favorite. They are a good source of folate, manganese, protein, vitamin B1 and potassium. Lentils have the second highest amount of any plant protein except soybeans and they reduce the risk of prostate cancer. They are incredibly delicious if they are cooked properly which is not very long. Simmer 1 1/2 c. lentils, 6 c. water and 1 1/2 teasp. salt just 12 - 15 minutes and then season with 1 T. olive oil, almost any herbs and pepper to taste. Taste them before you add more salt. This makes 4 1/2 cups of cooked lentils. They need to be crunchy, not mushy, so don't overcook. They go well with low glycemic vegetables, a salad or any protein, and are especially delicious with fish. Unlike all the other beans, lentils are high fiber foods and have the advantage of being a nutritious "fast food!" All of these grains are high fiber and belong on any low glycemic food list. Unless it's chilled and has high amylose content, white rice should not be eaten on a low glycemic plan. Brown rice is moderately glycemic and is very high in fiber. Grains and legumes (beans) are a wonderful substitute for red meat because combined they make a complete protein. Most commercial rice is high glycemic, especially the white rice available here in the U.S. that is usually industrially refined and lacking in essential nutrients. Asians who eat rice as a staple and have low body fat eat their rice with protein (which reduces the glycemic response) and lots of low glycemic vegetables. Parboiled high amylose rice has the lowest glycemic index. Amylose is the relatively soluble portion of starch which means it dissolves in liquid. It stays in the small intestine longer, takes longer to digest and makes you feel fuller. High amylose content means less calories too. When white rice is chilled it has amylose content. Apparently, when it is chilled, just like with potatoes, the cooling creates the resistant resistant starch which does not raise blood sugar levels. In Chef MD's Big Book of Culinary Medicine written by Dr. La Puma, it says that researchers in Japan discovered that adding vinegar to sushi rice also decreases the glycemic index of rice by 20 - 35%. So, eating sushi or rice rolls is another way to enjoy this versatile, nutritious grain. When brown rice is eaten with vegetables and meat, eggs or fish, the glycemic index is reduced. Milling of brown rice only removes the hull. The bran and germ remain with all the fiber and nutrients. Brown rice contains B vitamins, magnesium and selenium and a high amount of fiber. Texture matters so be sure not to overcook it. Brown rice is a high fiber, highly nutritious, cleansing food and can be included in your permanent weight loss plan. It is the basis for Asian cooking which is a wonderful way to eat to be slim. Here's how to cook brown rice. Brown rice takes about 45 min. to cook. You need 1 1/2 cups of water to a cup of rice. Bring the water to a boil, add the rice, put the lid on and turn it down to a simmer. To reduce the glycemic response of cooked rice, make sure it's not clumped and "sticky." Cooked rice should be dry with the grains separate and not refined. Check the rice often and better yet, use a rice cooker. A rice cooker will ensure that your rice has a lower glycemic index. It will also make your cooking so much faster and easier! High fiber foods lower cholesterol. They help prevent colon cancer, constipation, hemorrhoids and other disorders. Fiber even helps to remove toxic metals from the body. Modern refining processes of foods removes most of the natural fiber, so that most Americans do not get nearly enough in their diets. This is one of the primary reasons for diseases related to obesity...eating too many highly processed, refined foods. No wonder Americans are fatter. This does not need to be you! Read the articles below for more information on how to eat to keep your blood sugar low and stay healthy and slim! Return from High Fiber Foods to Foods That Lower Blood Sugar. Return from High Fiber Foods to Lifetime Fat Loss home page.